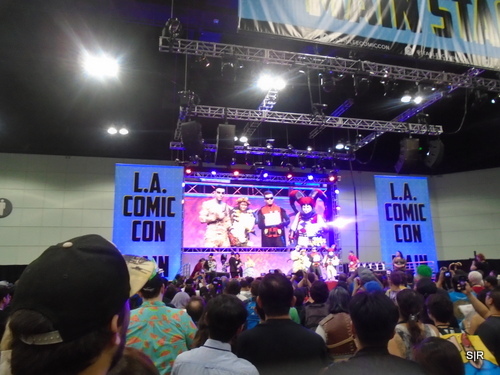 This panel was hosted by the president and vice president of Edgar Rice Burroughs Inc, the company that oversees the use of the iconic characters from the works of the famous pulp novelist. The panel has some interestingvideo interviews with people influenced by Burroughs works as well as a general discussion about the publishing history of his franchises. The panel covered the new Tarzan cartoon on Netflix, the upcoming collections of the Tarzan stories, and the status of the new Tarzan pen and paper RPG game. Beyond that there was discussion about future John Carter projects including the current comics based off of the Martian kingdoms. It was an interesting panel that put a spotlight on stories that helped define the adventure genre as well as introducing people to the new adventures. This panel was brought to you by Final Draft and the moderator made sure you knew that. This panel was hosted by a group of filmmakers who have been experimenting with VR movies and storytelling. The discussion began with a look at how to format a story and then built into the problems the medium. Some of the panelists were more optimistic while others felt that it would take years for the technology to get to a good point for proper cinematic storytelling. The moderator didn’t do a good job keeping control as the topics bounced around and the panelists got into arguments. The most interesting side subject was the possibility of using VR for education where student could live history as well as see the microscopic worlds of biology. It is unfortunate that this panel was so unfocused because there was so much potential with this new medium. The Crow: Where the Hell is James O’Barr? (Hint! He’s right here! ): This was one of the rare opportunities to see James O’Barr as he discusses his career and the cultural impact of his famous indie comicbook The Crow. He talked about how his local comic shop started a publishing line and from there he was able to start getting his book out to wider audiences. The discussion also covered the movies and how O’Barr got taken advantage of by Miramax and his hopes for a better relationship with Hollywood after the release of a new Crow movie next year. The panel wrapped up by covering O’Barr’s newest project that adds a new story to the Crow universe via a reworking of the original Crow 2 script that was rejected due to featuring a female lead. James O’Barr is a fascinating fellow who generally avoids the Internet and isn’t very social, but if you have the chance to meet him you can learn quite a bit about working in the indie comics market. Prepare your wallets! The dealers hall at LA Comic Con makes up the entirety of South Hall. Compared to Anime Expo, there’s still a lot of walking room to get around as well as programming space integrated in the dealers hall. The dealers hall also had autographs from celebrities, a small set of Star Cars, artist alley, and typical comic con style dealers. 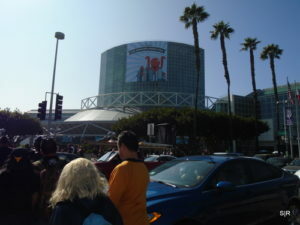 Though this is a comic con, there were a handful of comic dealers. Any booth selling actual books were mostly focused on the latest hero books. 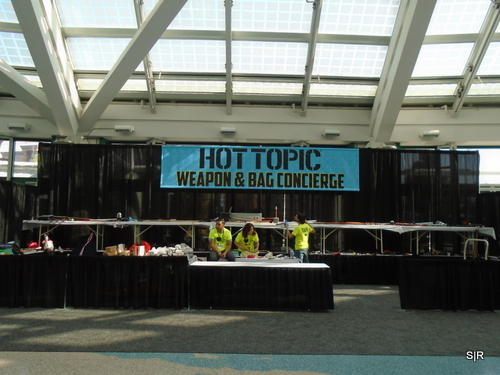 For single issue collectors, there were a few golden and silver age dealers present. 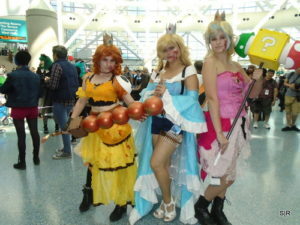 For me, I liked seeing the geek themed couture dealers gracing the dealers hall. Because the concept of “geek bounding” has become popular, a few booths were selling dresses inspired by Disney and Harry Potter house colors. 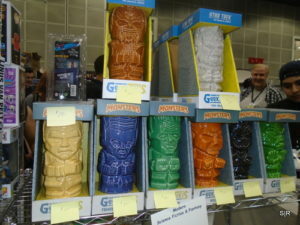 For tea geeks, there were a few booths that sold teas themed to nerd stuff and traditional tea leaves for every ailment. Because this con is so close to the holidays, the dealers hall made a most excellent place to shop for loved ones during the holiday. I got my brother in law a Star Trek scientist tie and my bestie a rare Funko Pop that was exclusive to Star Wars Celebration, but wound it’s way in the LA Comic Con Dealers Hall. 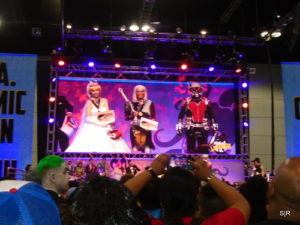 The cosplay contest took place on the main stage in South Hall. 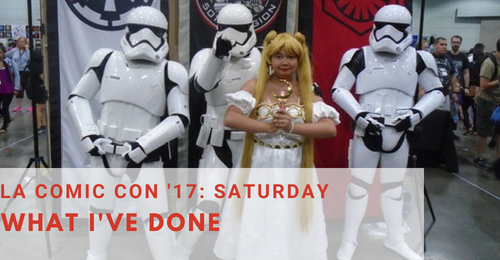 Unlike anime cosplay contests, this was open to everyone to watch – no separate room needed. 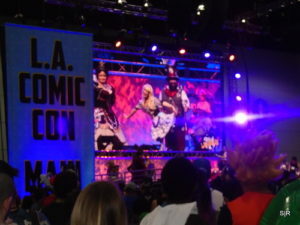 The stage was huge and also broadcasted the cosplay contest on screens where people on the other side of South Hall can see the show. The format of the contest had contestants walk up on stage and they would answer questions from the MC. Not my style of competition, but it was nice to see people’s hard work on stage.